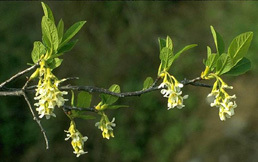 Indian plum is found west of the Cascades. It ranges from coastal southern British Columbia through northern California (1). Indian plum is found at low elevations (1). It prefers the climate typical of the Pacific Northwest coast: Mild temperatures and moderate to high rainfall during winter months, although it is drought tolerant during summer months. Indian plum is common west of the Cascades. Due to a preference for open areas, it is often found along roadsides and does well in disturbed areas (1). Indian plum prefers dry to moist, open woods. It is often found on stream banks and in open areas, such as roadsides (1,7). Indian plum is a late seral, understory, forest shrub. Indian plum is often found growing near elderberry (Sambucus racemosa), red osier dogwood (Cornus sericea), stinging nettle (Uritica dioica), vanilla leaf (Achlys triphylla), foamflower (Tiarella spp.) and salal (Gaultheria shallon) (3). Seeds can be collected. Hardwood cuttings are also successful. This plant produces numerous suckers, which can be removed from the parent plant during the winter months and will survive on their own in favorable conditions (3). Plants less than 5’ also salvage well (7). Due to its popularity with birds, seed should be collected in June as soon as it ripens. It can then be dried whole and sown in the fall (6). There are variable results from hardwood cuttings. For best results, use vigorous 1-yr old wood and take the cuttings early in winter prior to bud swell (4). Germination of spring-sown seed is more successful if the seeds are cold stratified for four months (3,7). During this process, seed germination may occur. The seeds should be monitored bi-weekly and sprouted seeds removed (7). Seeds can be stored and should be cleaned before storage (7). Information on seed shelf- life is not readily available. Information on recommended seed storage conditions is not readily available. Propagation from seed is successful. Vegetative propagation from cuttings and suckers is moderately successful (4,7). Indian plum does not appear to have any specific soil or inoculum requirements. Indian plum can be installed as container or bare root material. Rooted suckers and seeds can also be used with success. Although indian plum is drought tolerant, periodic watering during establishment is necessary. Deep watering may not be necessary due to its shallow, spreading root growth (5). Indian plum has a short longevity (5). It is fairly fast growing and may eventually may reach a height of 5-16’ (7). (1) Pojar, J. & MacKinnon, A (eds.) (1994). Plants of the Pacific Northwest Coast. Vancouver, BC: Lone Pine. (2) Riparian (Stream side) vegetation, Public information handout number 31-D. Clark County Department of Community development. (3) Hansen, W. Native Plants of the Northwest. http://www.nwplants.com. Retrieved April 4, 2003. (4) Crowder, W. & Darris, D. Producing Pacific Northwest Native Trees and Shrubs in Hardwood Cutting Blocks or Stooling Beds. http://www.wsu.edu/pmc_nr cs/technotes/plant_materials/tntpm38.htm. Retrieved April 4, 2003. (5) King County Department of Natural Resources. Role and Use of Vegetation. http://dnr. metrokc.gov/wlr/biostabl/PDF/9305BnkStbCh6.pdf. Retrieved April 4, 2003. (6) King County Department of Public Works (1994). Northwest Native Plants: Identification and Propagation for Revegetation and Restoration Projects. (7) Leigh, M. (1999). Grow Your Own Native Landscape: A guide to identification, propagation, and landscaping with western Washington native plants. Washington State University Cooperative Extension.